Chief Justice of India has constituted a five members Committee of Supreme Court Judges to look in to the Grievances of members of Supreme Court Bar Association. The Committee is comprised of Justice Anil R Dave, Justice JS Kehar, Justice Dipak Misra, Justice R.F. Nariman and Justice U.U.Lalit. Pursuant to this the General Body meeting postponed by 6 weeks. "I have no personal agenda. CJI had invited me to meet him but I don't want to meet individually but only as the representative body. We will celebrate Independence Day and Law Day functions without inviting any of the dignitaries. Today Mr.Venugopal and Mr.Kapil Sibal met me and asked whether they could mediate. I said we are not going to go to the Judges but if they could intervene it is more than welcome. They met CJI at 10.20 am and the CJI has now constituted a Committee. This GBM is now Postponed for 6 weeks for the Committee to address our grievances. If they are not intervening, we'll again meet and pass the Resolution. This acknowledgement is the beginning of the restoration of our dignity". Respected Members are informed that in the General Body Meeting held on today, Wednesday, 8th July, 2015 at 3 pm at Plaza Canteen, Supreme Court Premises the following was decided. "The General Body unanimously resolves to defer for six weeks, consideration of the Resolutions mentioned in Agenda dated 03.07.2015, in view of the letter dated 08.07.2015 of the Officiating Secretary General, Mr. M.K. 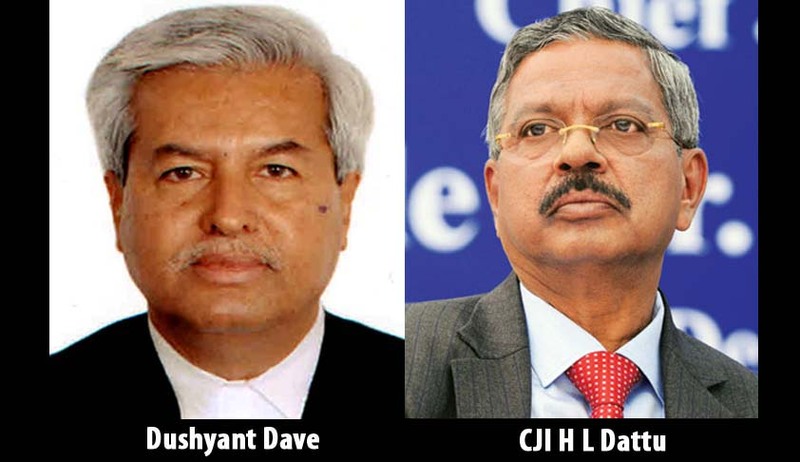 Hanjura informing us that Hon’ble the Chief Justice of India has constituted a Grievance Committee comprising of Hon’ble Mr. Justice Anil R. Dave, Hon’ble Mr. Justice Jagdish Singh Khehar, Hon’ble Mr. Justice Dipak Misra, Hon’ble Mr. Justice R.F. Nariman and Hon’ble Mr. Justice U.U. Lalit to look into the grievances of the Supreme Court Bar Association. The House also unanimously resolves to record its appreciation of the President, Mr. Dushyant A. Dave, Sr.Adv." “1. Supreme Court Bar Association Resolves that following Mahatma Gandhi’s principle of Non-Cooperation, Members of Supreme Court Bar Association, will not participate in any Official Functions with Hon’ble Judges of the Supreme Court, including References, Independence Day and Law Day and further Resolves not to give any Farewell Function to Hon’ble Retiring Judges, till 2nd December 2015 or till such time as our Just Requests, detailed in our various communications dated 15.1.2015, 28.1.2015, 29.01.2015, 04.02.2015, 04.02.2015, 20.02.2015, 14.05.2015, 22.05.2015, which are absolutely necessary in the interests of Members of the Bar, are acceded to, in an atmosphere of mutual respect. The Executive Committee also resolved that in view of the persistent failure by the Hon’ble Judges to allow meeting to take place in inner lawn of Supreme Court, the only place left to ensure organized and secure meeting, is Plaza Canteen. Therefore, it is decided that General Body Meeting will be held in the Plaza Canteen on 8th July 2015 at 3 pm. Members may also note that the right of Participation in the GBM will be restricted to SCBA Voter’s List-2015, following the judgments of Hon’ble Supreme Court passed in C.A. No.3401/2003 in SCBA Vs. B.D. Kaushik. Hon’ble Members are requested to cooperate and bring proximity card to enable entry for them.